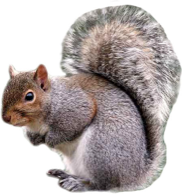 The grey squirrel is a serious pest causing damage by stripping the bark from trees trunks, causing problems for market gardens, parks and gardens where cereals and vegetables can be taken. Squirrels are becoming an increasing problem in urban areas where, if they can gain access to roof spaces, can cause damage to roof timbers, electrical wires and plumbing. Control is achieved by use of squirrel traps.